Domains are leased on an annual basis, and need to be renewed once the current payment for the lease expires. If a domain is registered on April 15, 2010 and prepaid for one year, it will be due for renewal on April 15, 2011, at which point the registrant either pays for additional years, or lets the name expire. 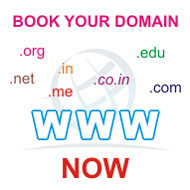 Domains can also be pre-paid for multiple years, up to a maximum of 10 years.